The Solar Foundation released its eighth annual National Solar Jobs Census, a report on solar employment nationwide and by state. 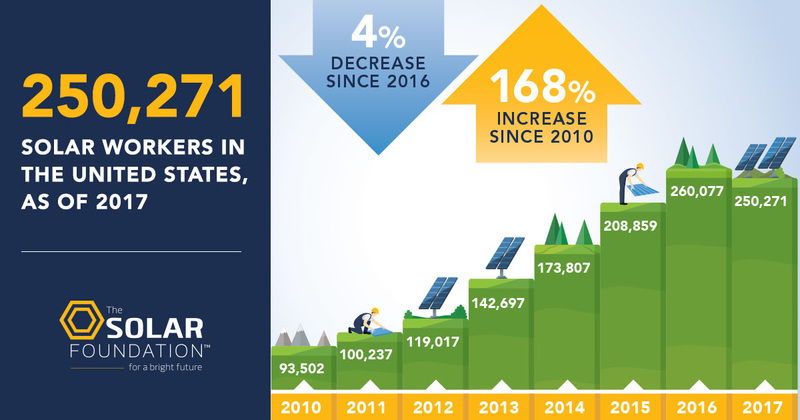 You can download the full report and view an infographic, state-by-state numbers, and other details at SolarJobsCensus.org. This year, the National Solar Jobs Census 2017 reported the first decline in solar jobs since The Solar Foundation began tracking jobs in 2010. As of November 2017, the solar industry employs 250,271 workers -- a decline of 3.8%, or about 9,800 fewer jobs, since 2016. While this may sound discouraging, it’s important to note that the long-term trend for solar jobs has been very strong. Solar employment since 2010 has grown by 168%, from just over 93,000 to more than 250,000 jobs in all 50 states. At the state level, jobs declined in several states with well-established solar markets, including California, Massachusetts, and Nevada. Jobs increased in 29 states and the District of Columbia, including many states with emerging solar markets. States with significant employment gains include Utah, Minnesota, Arizona, New Jersey, New York, Tennessee, and others. Visit the Census web page for a complete table of solar jobs by state. Next month, we will release an update to our Solar Jobs Map with more detailed state jobs information and a breakdown by county, metro area, and congressional district. A slowdown from the record-setting industry expansion seen in 2016, when installed capacity doubled in anticipation that the federal investment tax credit could expire. In 2017, solar installations continued at a more moderate pace. Policy and economic challenges led to job declines in well-established solar states, such as California. Uncertainty over the outcome of the Section 201 trade case and its impact on the U.S. solar market. While the Census survey took place in October and November 2017, before the final outcome of the trade case was known, 86% of solar companies indicated their businesses would be impacted negatively if trade restrictions were imposed. Demand-side sectors (installation, sales & distribution, and project development) make up almost 78 percent of overall solar industry employment, while manufacturing makes up 15 percent. Demand-side sectors lost approximately 7,500 jobs in 2017, while manufacturing lost about 1,200 jobs. 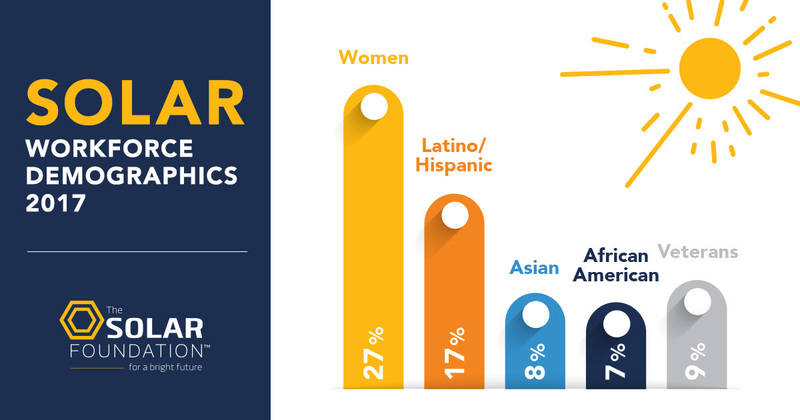 The solar industry is more diverse than comparable industries, but more needs to be done to ensure it is representative of the greater U.S. population. Women made up 27 percent of the solar workforce in 2017, down 1 percent from 2016. Veterans made up 9 percent of solar workers, which is 2 percent more than the overall U.S. workforce. Solar jobs pay higher than the national average and are open to a wide range of experience levels and educational backgrounds. Looking to the future, the industry faces major challenges in the coming year, including the impact of new tariffs. At the same time, continued state and local support, along with continued interest in decarbonization, resilience, and financial savings at the commercial, state, and local levels, all point to a strong long-term outlook for solar. The full report includes much more detail on these findings, as well as information on installer efficiency; solar industry demographics; wages and hiring trends; recommendations; and more. 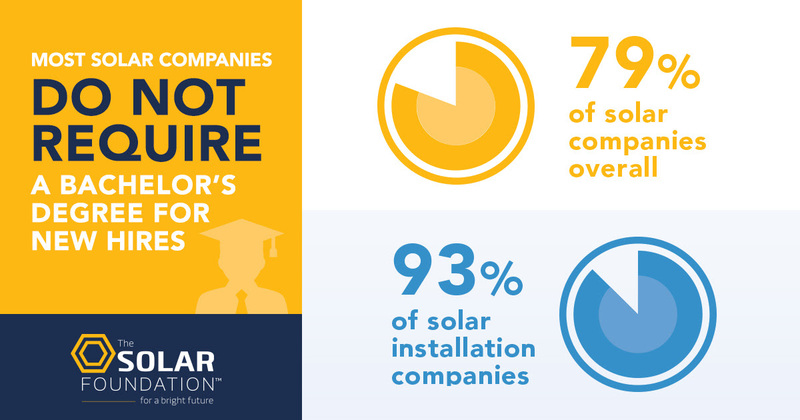 The Solar Jobs Census would not be possible without the participation of thousands of solar companies that take part in our annual survey. We thank you for participating and helping us obtain accurate, reliable data on employment in this dynamic, fast-growing industry.